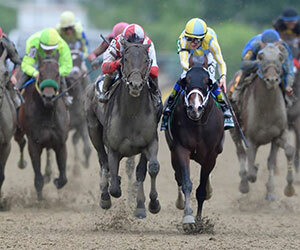 KlaravichStables and William H. Lawrence’s Cloud Computing tracked a hotly contested pace duel between Kentucky Derby (G1) winner Always Dreaming and Classic Empire into the far turn before launching a determined stretch run and pulling off a 12-1 upset in Saturday’s 142nd Preakness Stakes (G1) at Pimlico Race Course. The lightly raced colt, who had won only one of three previous starts, edged Classic Empire, the 2016 juvenile male champion and 2-1 second betting choice, by a head while awarding trainer Chad Brown with his first success in a Triple Crown event. The 142nd Preakness produced all-time records in both handle and attendance. The total handle for the 14-race program that included eight stakes, four graded, was $97,168,658, a three-percent increase over last year’s betting total of $94,127,434. A crowd of 140,327 eclipsed the 2016 attendance of 135,256. Grammy and Billboard Award-winning electronic music artist Zedd joined country music superstar Sam Hunt, Good Charlotte, LOCASH and High Valley to entertain the record crowd while taking part in InfieldFest. Cloud Computing, who finished third in the Wood Memorial (G2) and Gotham Stakes (G3) after breaking his maiden in his Feb. 11 debut, is the first horse to win the Preakness after bypassing the Kentucky Derby since Bernardini gave jockey Javier Castellano his first victory in the 1 3/16-mile Classic in 2006. The Brown trainee gave Castellano his second victory in the Maryland Jockey Club’s signature event. Always Dreaming, the 6-5 favorite who had registered a 2 ¾-length triumph in the Kentucky Derby at Churchill Downs May 6, gave way on the turn into the homestretch and finished eighth under John Velazquez. Always Dreaming set the pace in front of the grandstand, around the first turn and along the backstretch, pressed on his outside by Classic Empire during fractions of 23.16 seconds, 46.81 and 1:11 for the first six furlongs. Meanwhile, Cloud Computing rated nicely behind the dueling pace horses while saving ground before being eased to the outside on the turn into the homestretch as Always Dreaming began to give way. Classic Empire opened a three-length lead at the top of the stretch under Julien Leparoux, but Cloud Computing gained steadily before edging to a slight lead approaching the wire. Cloud Computing ran 1 3/16 miles in 1:55.98 over a fast racetrack that started Saturday’s program as muddy. Brown and his crew welcomed Cloud Computing back to Belmont Park Sunday morning, some 15 hours after the colt’s dramatic victory in the 142nd Preakness Stakes (G1) at Pimlico Race Course.